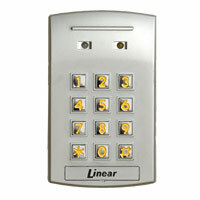 Linear’s AK-3 is a digital keyless entry system designed for access control applications. The keypad is housed in a rugged, plastic enclosure and is designed to be mounted in a standard single-gang electrical box. The die cast keys have bright, easy-to-read yellow graphics. Up to 480 codes programmable from the keypad. 4 independent outputs with programmable actions, activation times. 2 Form “C” relay outputs. Dual color status indicators to display access, lockout, and programming data. Door sense input for control of auto relock and door-ajar features. Same as product number ACP00903.